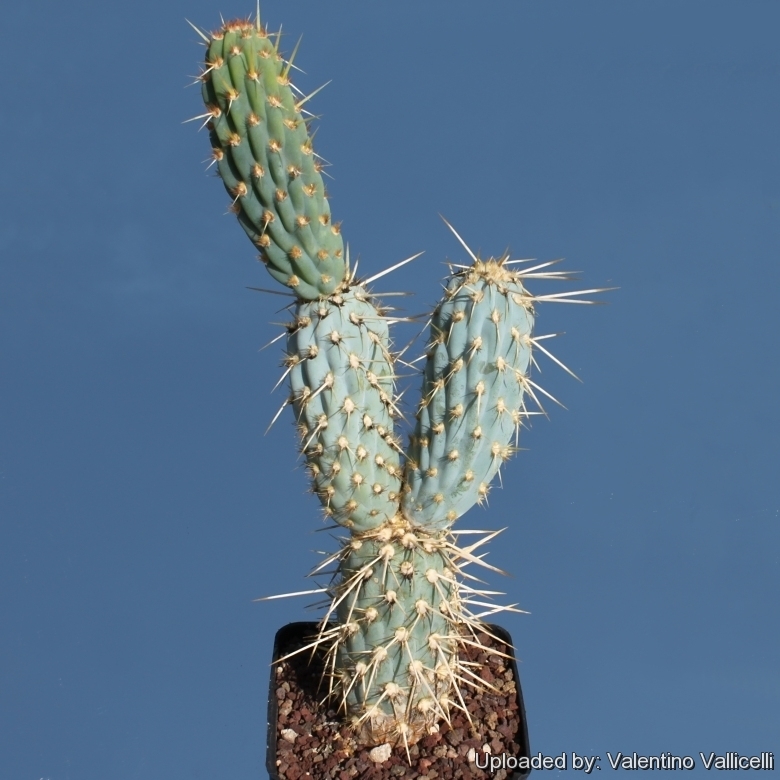 Origin and Habitat: Miqueliopuntia miquelii is widely distributed in the Chilean coast from the Elqui Valley north to Copiapo (regions of Coquimbo and Atacama). Altitude range: 0 to 1,500 metres above sea level. 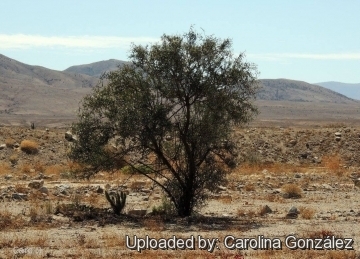 Habitat and Ecology: The species is confined to the deserts of northern Chile, in a wide array of soils. Guanacos disperse the segments and seeds. Miqueliopuntia miquelii, Opuntia berterii and Eulychnia acida are often the most characteristic elements of the bush in their range. 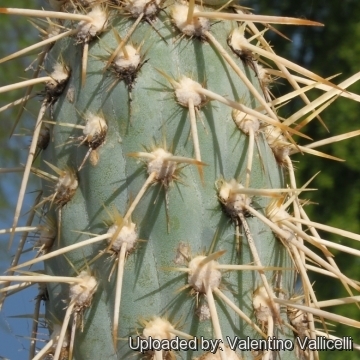 Miqueliopuntia miquelii is very abundant, the population is increasing, and there are no major threats. 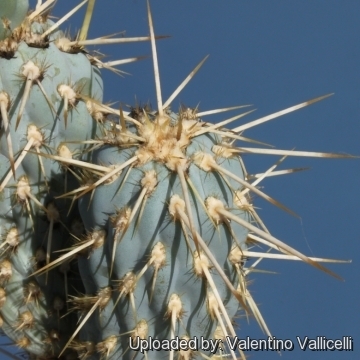 Austrocylindropuntia miquelii var. jilesii Backeb. 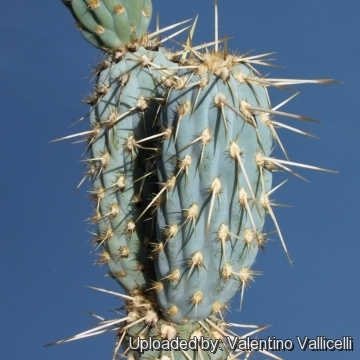 Description: Miqueliopuntia miquelii is the only species comprised in the genus Miqueliopuntia. . 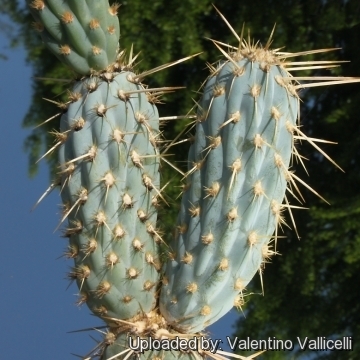 It is an uncommon many-branched, upright, bushy, opuntioid cactus , with elongated cylindric bluish joints from Chile, forming large thickets 1-1.5 m high and 2 to 5 meters wide. Derivation of specific name. The specific epithet honors Dr. Friedrich Anton Wilhelm Miquel (1818–1871), Dutch physician and botanist, director of the botanical gardens of Rotterdam, then Amsterdam, and finally Utrecht. Stems: Cylindrical, much branched, usually less than 1 meter high, but occasionally 1.5 meters high, with numerous lateral branches. Old branches bluish, with low tubercles sometimes 2 cm long; young joints bright green, with high tubercles flattened laterally. The segments, often arising near the tips of older segments, are rather short and clearly jointed, stout, 7-20 cm long, 3-6 cm in diameter. Areoles: up to 60 i neach joint, circular, when young filled with white wool, in age somewhat elevated. Leaves: Minute, 2 to 3 mm long, early deciduous. 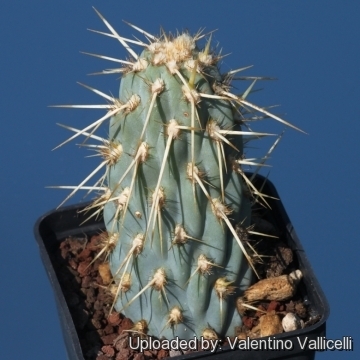 Spines: Tardily developing on the areoles, but formidable on old branches, needle-like, very unequal, in clusters of 8-16 or more, the longest ones nearly 10 cm long, yellowish to dark brown, whitish or greysh in age. Glochids: Numerous, brownish, caducous, 4-8 millimeters long and usually found in the upper part of the areoles. Flowers: Large nearly white to pink, borne near the stem tips, not opening fully, rather variable in length, up to 8 cm long including the ovary. Tepals broad, apiculate, 2 to 2.5 cm. long. Filaments rose-colored. Pericarpel strongly tuberculate with areoles filled with numerous brown bristly glochids and subtended by minute leaves. Style white; stigma-lobes green. Blooming season: Flowers only at adult stage often after decades, it is said of plants that have not done any flowers for the first 50 years. Fruits: Pale green to whitish, spherical to elongated and covered with bristly spines. Seeds: Variable-shaped, yellowish white to ocher and 3.5 to 5 millimeters long. 1) Hunt, D., Taylor, N. and Charles, G. “The New Cactus Lexicon.” dh Books, Milborne Port, UK. 2006. 3) Anderson, E. F. “The cactus family” [lists as O. "sulfurea" G. Don]. 2001. 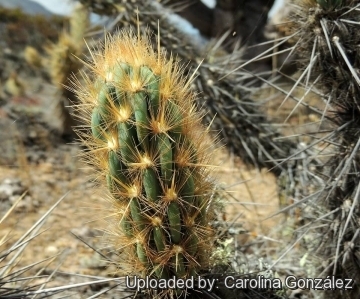 4) Backeberg, C. “Die Cactaceae.” 412–413.1958. 5) Backeberg, C. “Das Kakteen Lexikon.” 331–332.1977. 6) Faundez, L., Saldivia, P. & Walter, H.E. 2013. Miqueliopuntia miquelii. The IUCN Red List of Threatened Species 2013: e.T151986A584148. http://dx.doi.org/10.2305/IUCN.UK.2013-1.RLTS.T151986A584148.en. Downloaded on 16 February 2016. Cultivation and Propagation: This species needs moderate watering during the growing season; keep dry in winter. It requires a very drained and mineral potting mix and a full sun exposure. Propagation: Seeds are seldom available and extremely difficult to germinate. Best reproduced by cutting.